DUBAI: It shaped up as the most competitive match of the series, but in the end, Australia couldn't keep up with Pakistan. A 93-run opening stand between Sahibzada Farhan and Babar Azam -- who top-scored for Pakistan yet again with 50 -- took Pakistan to a total in a region that's been too good for Australia all series. 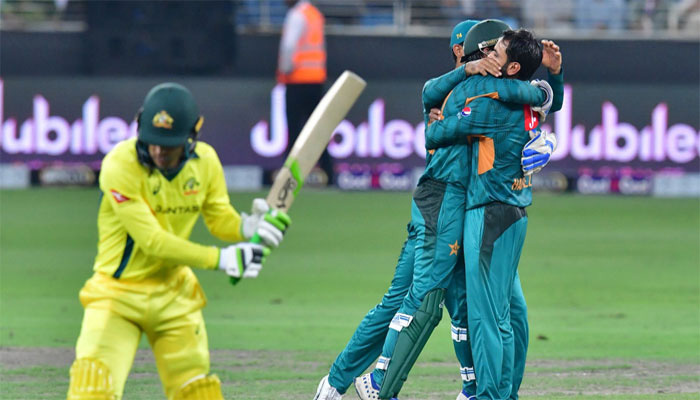 This time they reached a square 150, and even though the visitors started brightly— Imad Wasim was dispatched for 20 in the first over -- the pressure of Pakistan's bowling took its toll on Australia. Aaron Finch's men ended up comfortably second best, bowled out for 117. That's what they've been in comparison to Pakistan all tour, and that's how they go home. In their own way, these three T20Is have been uncannily similar. Particularly so the first innings, where a big partnership up top for Pakistan (inevitably involving Babar) has set Pakistan on their way to a total that, with the right finish, would see them post in excess of 170. This time Farhan, playing just his second T20, was his partner in crime. His first T20I had also come against Australia, in the final of the tri-series in Harare, where he had been run out for 0. This was a far more memorable game for him, as he took responsibility for assuming the Fakhar Zaman role, smashing three sixes and two fours on his way to 39. His stand of 93 with Babar, which was the biggest partnership all series, set Pakistan on their way to a score Australia would find too steep. Yet again, though, Australia hit back in the death overs with regular wickets to prevent Pakistan running away with it. Adam Zampa, who has been excellent all series, kept a leash on Sarfraz Ahmed's men in the middle overs, and there was time for vice-captain Mitchell Marsh to bowl the penultimate over which removed both Shoaib Malik and Faheem Ashraf. Only 11 came off the last two overs, and it seemed Australia had carried the momentum with them into the chase. It showed in the way Alex Carey, promoted to open the batting for Australia, played Imad. In the first two games, Imad was the man who built the pressure for the bowlers that followed, but here Carey dismantled him spectacularly, smashing two fours and two sixes in the first over as the asking rate came sliding down to under seven with just six balls bowled. But Australia couldn't get the partnership going, and when Finch and Carey fell within three balls of each other, Pakistan had already climbed their way back into the ascendancy. Australia finished the Powerplay with exactly as many runs as Pakistan had managed in that passage of play -- 54 -- but the eighth over was the one that really killed them off. Shadab Khan broke through with his first delivery, with Lynn holing the ball to deep midwicket as he tried to play against the turn. But the gut punch was to follow four balls later. Ben McDermott had been playing adroitly in a cameo that might, with more luck, have become a match-winning innings. But a nasty mix-up with Glenn Maxwell at the other end saw him race through for a single even though Maxwell had stopped after no more than two steps. He was well past the point of no return before he became alert to the danger, and for the third time in three matches, McDermott had been run out. It is the only way he has ever been dismissed in international cricket; the only other game he played he ended his innings unbeaten. Even the most ardent Pakistan fan might have been able to spare some sympathy for him as he dragged himself off, seething. From there on, Pakistan's fielding was on a different planet altogether. More precisely, it was simply the Shoaib Malik show. The bowlers began to circle as they smelt blood, and the 36-year-old Malik was just as watchful of the moment. The first, to dismiss Maxwell off Shadab, was simple enough, but as they got harder, Malik rose to the challenge. Mitchell Marsh holed out with a half-hearted shot to long on, and Malik had to scamper across to take a smart, diving catch. The third one was the best of all, driving the final nail into an already fairly secure Australian coffin. D'Arcy Short pulled a back of a length Usman Khan ball to the midwicket boundary, and while it didn't have enough to clear the ropes, it seemed he might get a couple. Malik was in no mood to allow that, though, as he sprinted left from long-on at speeds 36-year-old legs didn't seem capable of sustaining. He got there with the ball inches from the ground, sliding to complete a remarkable catch that had Mickey Arthur purring in the pavilion. From that point on, Hasan Ali toyed with the Australian tail as Australia's miserable tour began to draw to an equally bleak conclusion. Sarfraz showed impressive reflexes himself to take a diving catch to his left off Hasan, and off the first ball off the final over, Zampa holed out to extra cover. 33 runs was the final margin of victory as Pakistan whitewashed Australia in a three-match series for the first time. It completed 26 wins in 30 matches under Sarfraz's captaincy in the format, while Australia were left to ponder over numbers that will not look remotely as impressive in Justin Langer's post-mortem.